The consistently great Secretly Canadian label has just released a 5 track EP by the – unbelievably still little-known – band The War On Drugs, entitled “Barrel of Batteries“. Secretly Canadian have this habit of signing your new favourite band. And The War On Drugs are no exception. 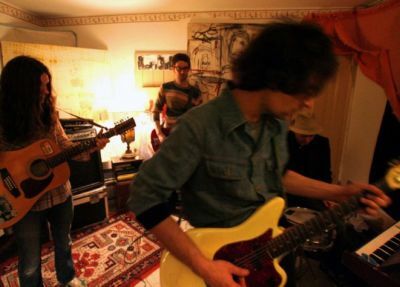 Distinctly Dylan-inspired, The War On Drugs nevertheless bring something new to the table… their delivery often recalls that of fellow bandmate, David Vandervelde, and we know how all things David Vandervelde are adored around here; so that’s a compliment of the highest order. Anyway, the EP is currently available from their site as a .zip download, and i strongly encourage you to give it a try. The only problem with it? At only 6 tracks – 3 of them instrumentals that clock in at less than a minute long – it doesn’t give you much time to get into the band. That said, word on the band’s website is that a full-length debut, entitled “Wagonwheel Blues” should be available sometime this year, so hopefully we won’t have much longer to wait.